A state judge has sided with the Minnesota Department of Natural Resources in its decision not to renew a permit to controversial black bear researcher Lynn Rogers . In her 69-page recommendation, Chief Administrative Law Judge Tammy Pust agreed with the DNR that Rogers' hand-feeding of bears in the Eagles Nest Township area southwest of Ely constituted "a risk to public safety" by habituating the bears to human contact, and conditioning them to associate people with food. "The Agency has demonstrated by a preponderance of the evidence that renewal of Dr. Rogers' permit would not be in the public interest given the cumulative and continually increasing numbers of bears in the Eagles Nest Township area that are habituated and food conditioned, and which constitute a risk to public safety," she wrote. It's the latest development in a long-running dispute between the DNR and Rogers, who has gained a wide following through his practice of walking with bears and feeding them to gain their trust, and by placing cameras in bear dens and streaming the footage on the internet. The DNR first issued Rogers a permit to collar bears in 1999. But in June 2013 the agency decided not to reissue it, because of public safety concerns, and because of what it said was Rogers' failure to produce peer-reviewed studies based on his research permit. Rogers sued, and a district court judge last July agreed to allow Rogers to continue to keep collars on bears he had already collared, and continue to hand feed bears, with new limits, until an administrative law judge could hear the dispute. The two sides presented their cases to Pust in a hearing earlier this year. Rogers argued that food-conditioned bears are not more dangerous to the public. He also argued he wasn't required to obtain a DNR research permit to place research collars on bears, because that doesn't constitute "possession" of the bears as required in state statute. Pust agreed that while walking with bears or even feeding bears would not require a permit, she wrote that placing a tracking GPS collar on a bear, and intentional and repeated handling of a bear, do merit the definition of "possession," and therefore require a permit. "Dr. Rogers can continue to study bears in Minnesota," she continued. He can also continue to feed bears, and run field study courses to educate the public. He may even continue to walk with and study the already habituated bears. "What he cannot do," Pust wrote, at least without a new permit, "is collar or intentionally and repeatedly handle bears, or visit the dens of bears." DNR Spokesman Chris Niskanen said the judge's recommendation supports the agency's argument that hand feeding bears makes them less wild and more dangerous. "We heard from folks who testified before the ALJ that they are scared," Niskanen said. "They testified this habituation posed a safety issue for them and others." Rogers countered that some residents of the Eagles Nest township have peacefully fed bears for 50 years with few problems. 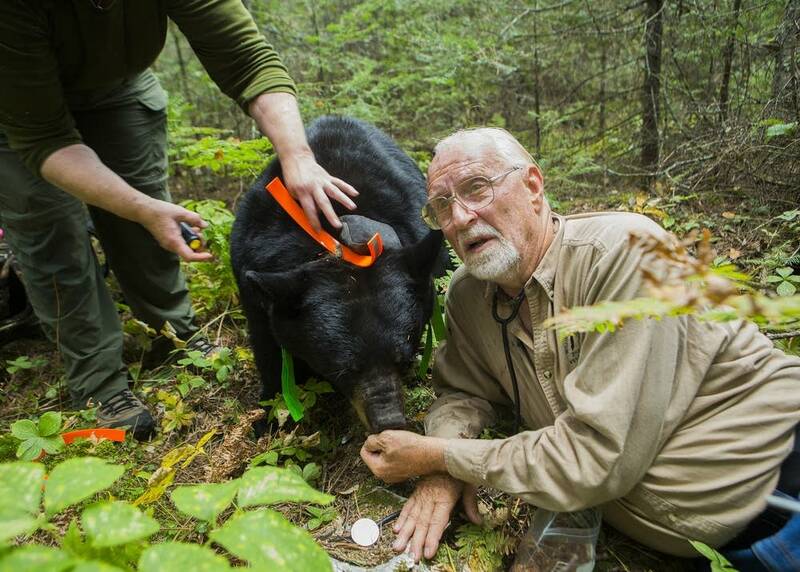 Even without a research permit, Rogers could feed bears and walk with them. But because he wouldn't be allowed to place GPS tracking collars on bears, he said that wouldn't be practical. "Without radio collars there's no way we can find the bears out in the woods, and there's no way we can put den cams in," Rogers said. "That's a huge loss to the public." Under the state's administrative hearing procedures, the judge's recommendation is not the final say. Kent Lokkesmoe, who manages the agency's Operations Services Division, will make the final decision. Until now, Lokkesmoe has not been involved in the Rogers case. Niskanen said it's not unprecedented for an independent decision maker in an agency to go against his employer's recommendation. "So it's not predetermined that Mr. Lokkesmoe will agree or disagree with the ALJ's decision," Niskanen said. Lokkesmoe has 90 days to make his decision. If it goes against Rogers, the researcher said he'll consider appealing that decision to the state appellate court.